The Tudor Rose is the heraldic floral emblem of England originating from the Tudor period. 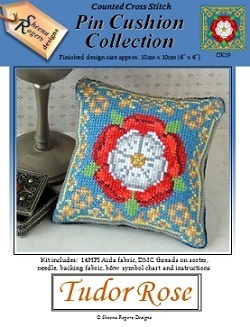 This pincushion features the Tudor Rose in the centre with a golden filigree pattern around the edge, on a bed of deep turquoise - a colour palette favoured by Henry VIII as can be seen in the ceiling decorations at Hampton Court Palace. Only whole cross stitch is required throughout this design.